These are the words of none other than Aristotle. It’s high praise for something with such duality of nature. Good pride is the result of hard work, effort, results — an inherently natural and powerful emotion. Bad pride, while often subtle, is illogical, stubborn, harmful, and stalling. And yet, Aristotle considered pride the crown of all virtues. It comes alongside our strengths and elevates them. Today, we as business owners have countless avenues to demonstrate our pride. Whether it’s our business decisions or our Instagram posts, pride is easy to flaunt when things are going well, but it can also be catastrophic to our growth. Pride has the potential to create problems. When things have been going good and they begin to slide. When things never were going well, but now you have eyes on you. When you aren’t sure how things are going, and you are trying to figure it all out. The healthy pride we feel in our accomplishments is easy to recognize. It’s the other types that tend to simmer beneath the surface. Because our businesses are often built on our passions, it’s more important than ever to understand how pride can harm our business and what we can do to prevent it. We all know those people who let their social media appearance trump profitable decision making. Pride is our desire to look the part, rather than act it. That desire can be very costly, especially once you start running a business. When we first start a business, we exercise an abundance of caution with how we use our resources. We make smart, frugal decisions out of caution. Of course, no matter how frugal you are, that initial startup cost will be steep. Hopefully, that initial frugality will sustain you long enough to allow a deeper investment in growing your business. Success pads our pride. It makes us eager to innovate. If we aren’t careful though, we can direct that energy to innovate into useless spending. With our businesses being more exposed than ever, our definition of success continues to inflate. It isn’t enough to make a comfortable living working your passion, you may also begin to feel the need to really look the part. Where are you hearing a voice telling you to invest in several thousand dollars worth of equipment upgrades, just for the prestige of it? Where are you throwing money away due to irrational emotional attachments? Do you still send money to the publication that got you your first client via print ad, even though you haven’t received another since? Pride is believing that those things are the answers to our business needs, rather the hard work that got us here in the first place. If you had the option to buy a designer jacket for $300 new, or that same jacket, hardly used, from a thrift store for $50, which would you choose? If money isn’t an issue, by all means, treat yourself to the new one. There is nothing wrong with responsible spending based on what you have. Owning our very own things can be a source of healthy pride, especially when we’ve worked hard to pay for them. But if the thrift store idea is hard to stomach, it might be helpful to examine where spending is being done to feed pride rather than meet a need. Being flashy with a jacket might not have lasting repercussions. Your business, on the other hand, is another story. Try going a week, at first, with spending the bare minimum you can on business expenditures. If you know you can accomplish a task you were about to contract out, do it yourself. If you are about to purchase time-saving equipment when you do have the time to get the job done without it, don't purchase it. See what you can cut out of your business, what is there for pride. And, personally, don't buy the $6 venti frap just so you an Instagram it to your #boss community if you really don't have $6 to spare. Brew a cup at home and get stuff done. That's what will really impress your community. This generation of creative business owners takes pride in the level of control we have. We build a brand on our passion, our skill, our expertise, and our decisions. We are vehemently opposed to the traditional career structure because we feel that we would make better decisions in most circumstances, that we would get the job done better if we were in charge. So what happens when our businesses, so very much a reflection of our selves, are best served by the expertise of someone else? If you’ve been wearing too many hats, trying to handle every aspect of managing a growing business, rather than relinquish some of that control when you get the chance, that’s pride. Emphasis on when you get the chance. When you’re starting, it's often necessary to do more than you can handle. What choice do you have? When you get to a point where you can not only consider bringing on some help, but need to, that is a wonderful milestone. Don't let pride get in the way; you should be proud you've grown enough to require delegating tasks to others! Unchecked pride means that, rather than celebrate the fact that we have grown in a way that requires new approaches, we wallow in a wounded sense of self. We don't allow ourselves to grow into something that may naturally suit us. We don't realize that letting go gives us more time to refocus our efforts. When we do everything, we run the risk of not thriving at anything. In fact, the same advice applies not only to the people in the business, but the business itself. Maybe you started a business with a particular vision in mind, but new opportunities and circumstances have caused your business to extend into various new areas of operation. If the profits say that your business is most successful when you're focusing on Venture B, is your attachment to Venture A holding you back? Maybe you started as a wedding photographer, but have since found success taking senior portraits and pictures of food for brands! When you take a wedding client, you feel burned out, or the payoff doesn’t justify the reward. Maybe it’s time to give it up in favor of what is actually bringing you clients and profits. Does "wedding photographer" sound nicer to you than someone who takes portraits of students and food? Should that matter more than having a flourishing business? Maybe. If you have a legitimate passion for something that isn’t providing as much practical value, it’s ok to stick to it to fill that personal need. But if you are stunting your growth, it could just be pride getting in your way. It’s the same thing as taking the massive lease out on a car you absolutely can’t afford. Don’t let wounded pride get in the way of you, your team, and your business all growing in a way that helps one another. Look at everything as an opportunity to grow and crush your niche. If you can't get immediate help, brainstorm some creative solutions. Reach out to a creative entrepreneur community for advice. There are a variety of qualities that we admire in leaders. They can be aggressive mavericks, geniuses, collaborative, empathetic, creative, compassionate, relatable. However, there is one common thread that seems to be universally admired. It’s found in almost all of our most revered leaders. It’s the ability to take more of the blame and less of the reward. Prideful leaders cannot model this behavior. There is always someone else at fault, an external reason for whatever struggle they come across. Similarly, when things go well, there is little effort to lift up those around them. Everything revolves around protecting their pride. This means a tendency to pounce on praise while resisting feedback. Good leaders trust their gut. They believe in themselves and carry themselves with confidence — a positive manifestation of healthy pride. They understand how to let others flourish, and they display trust in those around them. When you are obsessing over the credit you get, or casting aside the opinions of others, things begin to fall apart. You start to make irresponsible decisions. 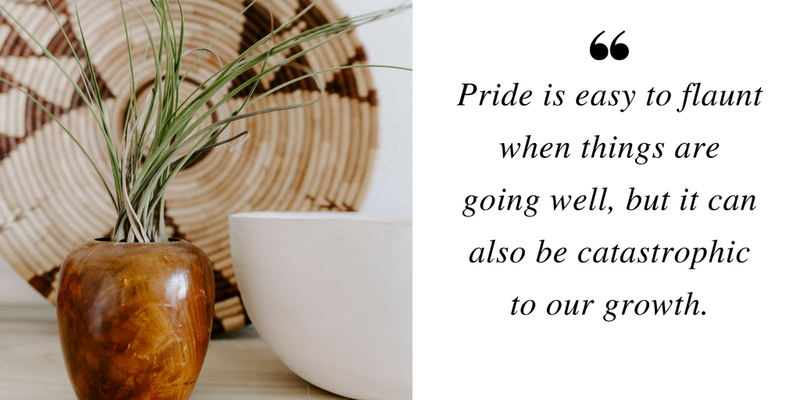 Leading from a place of pride can be good when it comes from a healthy place within. Let pride guide you. But let it be pride in what you've built and the people you've built up along the way. Find something about your business that has nothing to do with you and ask how you can put it at the forefront of your decision making today! Maybe it's about your team, or a way you can get involved in your community! Your story and your business is something to be proud of, make no mistake. If you went back in time to when you first started your business, would past you be proud of present you? If so, would they be proud of the right things? Make the you who got into this business — for all the right reasons — proud.